Way back in the early 90′s, I was an absolutely huge fan of Formula 1 (zeolot is the more accurate term, but I’ve grown up a bit since then), religiously staying up until the early hours of the morning to watch the entire F1 race season broadcast live from its respective country. The fascination went far beyond a bunch of cars doing laps around a track under the control of a bunch of very highly paid (and skilled) drivers. It extended to the vehicles themselves, the engines, the computational telemetry, the pit crews, the team structure and most of all the psychology behind it all. I loved (and still do) the technology, the fanatical focus on process and relentless drive to develop faster, better, more effective and more efficient ways of being more reliable, more competitive and ultimately more justifiable to the sponsors which shell out tens of millions of dollars in sponsorship money in the expectation of high profile media coverage. Of endless fascination to me is the pursuit of technical solutions to mundane, every day problems. Need to change tires faster. Reduce wheel nuts from 5, to 4, to 1, development of cross locking splines, keyed to the air gun. The result? Pit changes that went from 3 to 4 minutes down to under 5 seconds for 4 tyres. This was so fast, that new rules were introduced to force cars to refuel at the same time, increasing pit stop time to 30 seconds. Tyre technology: compounds, wet weather patterns and tyre wall structures evolved and refined itself, again and again, so much so that they introduced regulations to narrow the tyre width and introduced grooves to slow the cars down. The silica compound technology and asymmetric tread pattern variants became production vehicle tyre standards and are now benchmarks for performance. Turbos introduced forced induction, increasing power at astonishing rates. The rules around engine sizes were changed to reduce their capacity with the result that at their pinnacle, 1.5 litre engines were generating in excess of 1400BHP. This technology pioneered by BMW, Honda & Porsche has influenced production cars today with the introduction of variable timing (think: BMW Vanos, Honda VTEC, Porsche Variocam). They were subsequently banned: too much power. The list of the innovations in technology flowing on to production cars is endless: ABS brakes. Safety Crash Cells. Pre-fabricated crumple zones to aid in crash deceleration forces. The modern lap/sash harness. Non-submarining seats. The list is endless. So, it was with a certain amount of awe and reverence I met the news in 1992 – my first year in Uni and incidentally the year I got my drivers license – that the McLaren F1 team had formed a road going division under the guidance of Gordon Murray and were releasing a fully fledged member of the supercar aristocracy in a street legal road car – the McLaren F1. Every superlative that can be applied to supercars is valid here, where even 17+ years on, it is still the fastest naturally aspirated production engine vehicle in the world and is only eclipsed outright by the Koenigsegg CCR, the Bugatti Veyron and the SSC Ultimate Aero TT. Putting into perspective just how uncompromising a technological tour de force the F1 was – and still is – Top Gear UK last week pitted both the Bugatti Veyron and the McLaren F1 in a standing mile race. Whilst the Veyron won (it does have 1000 bhp), the F1′s acquitted itself in a fashion which is a fitting tribute to Gordan Murray’s unrelenting design and engineering focus. 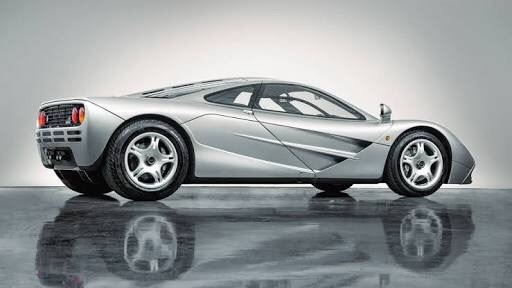 100 McLaren F1′s were made in total Road Cars: 64 F1, 5 F1 LM, 3 F1 GT and Race Cars 9 GTR 95, 9 GTR 96 & 10 GTR 97′s. Production of the McLaren F1 drew to a close in May 1998, with a total of 100 cars built, sold and delivered to customers. Of the 100 cars 64 were F1 road cars, five were F1 LM versions built to commemorate victory at Le Mans in 1995 and three were F1 GT road going versions of the long tail 1997 F1 GTR race car. The remaining 28 were F1 GTR race cars built for private customers competing in the FIA GT series and the 24 Heures du Mans. Much myth and conjecture abounds about McLaren’s and the various figures and feats which are reported. What cannot be denied is that even now, there are very few car marques, let alone single vehicles of any description, which have so universally and comprehensively been branded as superlative by every noted automotive commentator and publication globally. So, you can imagine my utter delight when I heard that McLaren are building a new range of sports cars from 2011. Ron Dennis, the former commander-in-chief of the McLaren F1 Team is taking the helm of the new business, with the splitting of McLaren’s production and racing divisions into an independent company – McLaren Automotive – severing ties with the SLR badged Mercedes-Benz vehicles at the end of 2009. The first vehicle off the rank has ostensibly been coded the P11, and is aimed at the likes of the Ferrari F430 / F430 Scuderia, Lamborghini Gallardo/ Gallardo Superleggera, Audi R8 and Porsche GT2/GT3/Turbo.